UK van company LDV has been sold to Russia's Gaz for an unnamed sum. LDV - formerly Leyland DAF - was saved from collapse when bought out of administration by private equity investors less than a year ago. Until now it has been one of a handful of British motor manufacturers still in British hands, and employs about 800 workers at its Birmingham plant. Gaz is Russia's second largest auto firm and the seventh-largest maker of commercial vehicles worldwide. Gaz, which makes cars, trucks and buses, is controlled by Moscow-based oligarch, Oleg Deripaska. 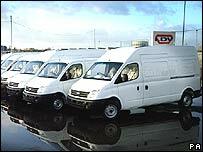 LDV manufactures vans and minibuses. It was set up in 1993 through a management buyout from truck maker Leyland DAF, which is now defunct. After running into financial difficulties and going into administration, it was bought by group Sun Capital/Sun European Partners in December 2005. It produces more than 13,000 vehicles a year at its Washwood Heath factory in Birmingham, close to the M6 motorway. Sun European Partners said since its acquisition, LDV had enjoyed a 100% increase in the year-to-date sales of its Maxus vans, had a strong order book, and had been able to introduce a new minibus ahead of schedule. Charlie Megan, acting chief executive of LDV Group said LDV was "a well-loved and long established brand in the UK". "We believe that Gaz will provide the necessary backing to support its future development in the UK and internationally," he said. The Transport and General Workers Union (T&G) welcomed the news, and general secretary Tony Woodley said: "When we seem to hear nothing else but vehicle makers and manufacturers pulling out of the UK, today's news, which bucks that trend, is welcome." The prospects for hundreds of jobs in Birmingham, he said, "must be good". Gaz said it had appointed former Ford Europe executive Martin Leach and former AT Kearney executive Steve Young to run the business. "Gaz plans to expand production at LDV's Birmingham plant by adding new product lines and entering new markets in the EU and elsewhere," it said in a statement. The firm becomes the second Russian owner of a UK automotive firm. In 2004, Nikolai Smolensky, son of Russian banking magnate Alexander Smolensky, bought sports car maker TVR.